Since I finished the LED retro on my xcube26 I have been really impressed with the vibrant colours, coral growth and amazing shimmer so after much planning and advice (thanks evil) I have decided to start a bigger project and upgrade my 75g to LEDs. I know this is nano-reef.com and this tank is not a nano but I thought it was appropriate to post this build thread here as its where I got all the advice from and I would like to share it with the other members but MODs please delete the thread if its a problem. The tank is a Fluval Osaka 320 and measures 48"(L)x18"(W)x24"(H) and is currently running 4 x 54w T5's. The rock is arranged in 2 "islands" so the plan is to have one array above each island and Im hoping this will give a nice unique lighting effect as well as reducing the cost a little as I will be using less LEDs than if I were to cover the entire tank. each array will have 12 CREE XR-E R2s and 12 CREE XR-E Royal Blues giving a total of 48 LEDs. These will be fitted with 60 degree optics. The LEDs will be cotrolled by an arduino which will allow automatic dawn/dusk as well as monitoring of the heatsink/led temperature. The Arduino will also control a small LCD screen allowing me to veiw usefull info such as temp and the current intensity of each colour of LED and there will be a joystick allowing me to set the time etc. Luckily, someone I work with has kindly done most of the work for this and its almost ready to go. I have made some drawings of the design I would like to follow. Heatsinks/Fans: 2 heatsinks on each side. They will be closer together than in the image. There will be enough space to add a third heatsink in future if required. Centre/cotrol box: The centre of the fixture will house the buckpucks, wiring and aduino etc. Photo of arduino, LCD screen and other components. Nice little LCD board. What's the board in the middle? Its a prototype board with the battery, RTC chip, crystal etc. Don't know if I would rely on the reference voltage from the Buckpuck to power the Arduino. It's not a fixed 5v output, and it only has 20mA capacity. If all you were powering was the micro, then maybe. Once you start adding sensors, RTC, and a display, that reference voltage isn't going to cut it. 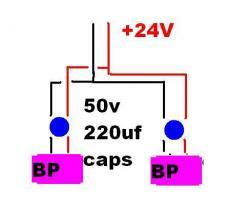 We are going to be using a seperate 9v power supply for the arduino.. must have forgotten to correct the diagram. Excellent. Shouldn't you be working? I can't look at this thread without %$%&&$# in my pants. dont you like the design? wow i wish i was capable of building a controller like that! Me too, Im lucky someone else is doing this for me and I will be able to just connect it to my array. I dont think the electronics are very complicated, Its the code behind it that seems to be the most complicated/time consuming part. Once its finished I will be able to just connect a laptop to the arduino and use a front end he has written to upload new settings (via an excel spreadsheet). Once its finished we will post all the details of the components and the code so it shouldnt be difficult to copy. You will have a bit of a wait for that unfortunately. I will be ordering the parts this week and It will be at least a month or 2 before its finished but I will post loads of photos of the build as I go. Does this PSU look ok? Im planning to use 2 so each one would run 2 1000mA and 2 700mA buckpucks and 4 fans. If Ive worked it out correctly this adds up to 3.4A@24V plus the fans which shouldnt draw much. PS. I wont be buying it from the place in the link as Ive found it much cheaper elsewhere... just posted the link for the info. Should be ok, but watch the max current at 24v. The power supplies I have seen like that have a lower output rating at 22v and 24v. Based on that spec sheet, it's max output is 90w, which is 3.75A at 24v. I bought that very same power supply for my system (arduino controlled pwm dimmed buckpucks). It works very well, the only thing i'd advise is that Maplins may be high priced, but don't go too cheap either and get a poor power supply that will fry itself or worse £££'s worth of pucks!! I think the 90w is incorrect and referring to another model as further down the page soemone has asked what the output is and the reply from maplin is "The item will support any item that runs off the following OUTPUT VOLTAGES: DC15V/16V/18V/19V/20V @6Amp and 22V/24V@5Amp max"
The cheaper PSU's Ive found are exactly the same (maplin branded) but half the price. I wasnt aware of the capacitor requirement between the psu and buckpuck. At whta cable lenght does this become needed? I'd be interested if you could forward me a link to the cheaper psu's in case I add a 3rd channel to my led's! If you check out Page 5 of the datasheet below, it says the capacitor is required for leads of greater than 18". The maplin charger lead on it's own is about 24" - 30" before you add any of your own connections! My pucks had a bit of history, ordered two from Cutter with my XR-Es, and they both ran 4 XR-E's fine from the power supply during testing; but got quite warm; as soon as plumbed in the last two leds and upped the supply voltage to suit the 6 off leds the first buckpuck fried. I figured it might have been a dud puck, so I tried the other one - fried! I ordered two more buckpucks and added a cap to each terminal. Both pucks now run all 6 leds and run cooler. So I can't definately prove that it wasn't a bad pair of pucks that blew of their own accord, but I do know the system works a whole lot better now with the caps in! Ordered the LEDs, drivers, heatsinks, fans and power supplies today. It all came to just over £550 which im pretty happy with. All thats left to pay for now is the case and some connectors etc. Im dying to get started now. Wanted to comment on this because it's been somewhat of an aggravation of mine in reading these LEDs threads. One thing I hate about fluorescent lighting of any kind (PC, T5, etc) is the tendency to light every square inch of the tank with the same uniform lighting. While this is kind of a subjective thing and varies with the size of the tank, I personally find it bland. I mean, how many thousands of reef tank pictures have we run across showing a few chunks of live rock, half a dozen corals, and 70% of the tank bottom nothing but substrate. But, the tank owner is lighting every square inch of it producing an environment that if we were honest for once looks like plastic reef replicas under a shop light. IMHO, the best looking (+30gal) tanks from an aesthestic perspective tend to be the ones running a lot of LR, and contrasty lighting concentrated in specific areas of the tank; typically the middle. So, I agree with the OP 150% on this and glad the issue was brought up. With the incredible versatility of LEDs I would certainly prefer showing a bit of imagination and concentrating light in specific areas based on where he plans on higher stacks of LR. Again, this is obviously something easier to do with a bigger tank than a smaller one. Also, you guys are missing a cheap and reliable source of 12volt current, and that's computer PSUs. I can get a new, 500watt computer PSU for $20, and many of us have old computers lying around with functioning ones. I have a commercial installation using a 400watt PSU I scrounged from a computer, and LED runs are in excess of 100feet. If the PSU dies in a few years, so what...I throw another on for free. That's 20+ amps of 12 volt for free -vs- a laptop supply that's not cheap and can't go near the current load. Just a suggestion. Thanks for the comments Blasterman. Im hoping this does turn out looking good as I too like the idea of spotlighting the important area(s) of the tank for a bit more of an unusual look. Whether or not it will end up looking the way I am imaginig it though is another matter . I must admit though that my reasons for doing it this way are partly for cost too as it will be about 30% cheaper than covering the entire lenght of the tank in LEDs. Im not an expert but I think the issue with using computer PSU's is the low voltage. Most people are using at least 24v power supplies as 12v would not drive many LEDs and would lead to having to buy a lot more drivers. For example, my array of 48 LEDs runing 24v PSU's will require 8 buckpucks running 6 LEDs each. If I used a 12v PSU each buckpuck would only drive 2 LEDs meaning I would have to use 24 buckpucks. Laptop power supplies are a slightly better option as a 19v one could drive 4 LEDs per buckpuck but depending on how many LEDs you need to use it may still work out cheaper to buy a 24v PSU.